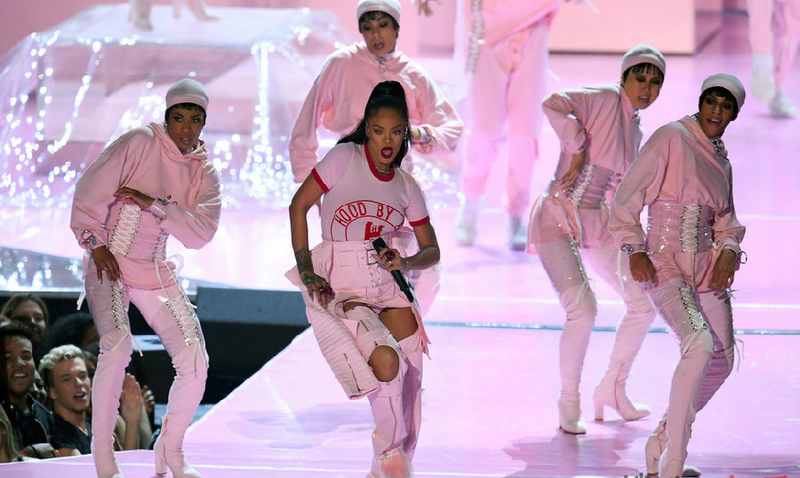 The MTV network held its Video Music Awards, or VMAs, Sunday night. Social media users are still talking about the stars and performances at the ceremony. Rihanna was honored with the Michael Jackson Video Vanguard Award. Her friend, singer Drake, introduced her and presented her with the award. In his speech, he declared his love for the singer. "She's someone I've been in love with since I was 22 years old," Drake told the crowd. He then tried to kiss Rihanna on stage. The media has long questioned the nature of Rihanna and Drake's relationship. Is it romantic? Or is it just friendship? One fan tweeted that she thought Drake might ask Rihanna to marry Sunday night. Another asked if this meant their relationship was now "official." Whatever Drake meant, Facebook posts and tweets seem to approve the message. One Twitter user asked "Can someone get me a Drake please?" Singer Beyonce arrived at the VMAs with her daughter, Blue Ivy, by her side. Her appearance was also a popular subject of social media discussion. The four-year-old Blue Ivy wore a $11,000 gown and a diamond tiara. One Twitter user said the little girl "stole" the show. But, some social media users criticized the amount of money spent on the child's clothing and jewelry. Social media was also excited about Alicia Keys at the VMAs. She reportedly went without wearing any makeup on her face. Many applauded her decision. One Twitter user wrote "I love Alicia Keys' no make up movement." Another wrote that Keys' decision was something for "women to get inspired by." Hard work can often make up for a lack of intelligence. All the children that have arrived at school age are enrolled. If a woman wanted a diamond tiara, she would explain that it was to save the expense of a bonnet. 1. "She's someone I've been in love with since I was 22 years old," Drake told the crowd. He was in love with her, although he did not put that name to it. Anyone would think you were in love with the girl. 2.One Twitter user said the little girl "stole" the show. Mary was only in one scene of the play, but she stole the show from the stars.